My name is Robert E. Scovill Jr. of Murfreesboro, Tennessee. I am a pilot and aircraft owner. My pilot certificate number is 2146452. This letter reports the potential for a hazardous quantity of fuel contamination to go undetected in a fuel sample taken during routine preflight procedure from a Cessna 150 or 152 fuel tank. Cessna Aircraft Company manufactured both tanks. These fuel tanks are certified by the DEPARTMENT OF TRANSPORTATION FEDERAL AVIATION ADMINISTRATION TYPE CERTIFICATE DATA SHEET NO. 3A19. "This data sheet which is a part of type certificate No. 3A19 prescribes conditions and limitations under which the product for which the type certificate was issued meets the airworthiness requirements of the Federal Aviation Regulations. Certification basis Part 3 of the Civil Air Regulations dated May 15, 1956, as amended by 3-4. In addition, effective S/N 15282032 and on for 152 and S/N 681, A1520809 and on for A152, FAR 23.1559 effective March 1, 1978. FAR 36 dated December 1, 1969, plus Amendments 36-1 through 36-5 for 152 and A152 only. In addition, effective S/N 15285940 and on, and S/N A1521028 and on, FAR 23.1545(a), Amendment 23-23 dated December 1, 1978. Application for Type Certificate dated August 13, 1956. Type Certificate No. 3A19 issued July 10, 1958, obtained by the manufacturer under delegation option procedures. Production basis Production Certificate No. 4. Delegation Option Manufacturer No. CE-1 authorized to issue airworthiness certificates under delegation option provisions of Part 21 of the Federal Aviation Regulations." Type certificate data sheet 3A19 refers to Part 3 of the Civil Air Regulations. "3.411 Components: (a) the power-plant installation shall be considered to include all components of the airplane, which are necessary for its propulsion. It shall also be considered to include all components which affect the control of the major propulsive units or which affect their continued safety of operation. (b) All components of the power-plant installation shall be constructed, arranged, and installed in a manner which will assure the continued safe operation of the airplane and power plant. Accessibility shall be provided to permit such inspection and maintenance as is necessary to assure continued airworthiness. 3.444 Fuel tank sump: (a) Each tank shall be provided with a drainable sump having a capacity of not less than 0.25 percent of the tank capacity or 1/16 gallon, whichever is greater. It shall be acceptable to dispense with the sump if the fuel system is provided with a sediment bowl permitting ground inspection. The sediment bowl shall also be accessible for drainage. The capacity of the sediment chamber shall not be less than 1 ounce per each 20 gallons of the fuel tank capacity. (b) If a fuel tank sump is provided, the capacity specified in paragraph (a) of this section shall be effective with the airplane in the normal ground attitude and in all normal flight attitudes. (c) If a separate sediment bowl is provided in lieu of a tank sump, the fuel tank outlet shall be so located that, when the airplane is in the normal ground attitude water will drain from all portions of the tank to the sediment bowl. 3.553 Fuel system drains: Draining shall be provided to permit safe drainage of the entire fuel system and shall incorporate means for locking in the closed position. The provisions for drainage shall be effective in the normal ground attitude." In November 2002, Matt Taylor, Director of Maintenance, Middle Tennessee State University and I performed a test on the Cessna 150 fuel tank. In December 2002, we replicated this test on the Cessna 152 fuel tank. Results from these tests may indicate that both tank models fail to meet the standards set forth in CAR PART 3-1949-SUBPART E given above. The tests were performed to experimentally determine if each tank's drain is located at the corresponding tank's sump. Red colored water was used as a heavier than fuel contaminant to locate each tank's sump. Then observations were made that visually determined the location of the water with respect to a tank's drain. Two images of intermediate test results are given on the next page. The first image, 150 Test Image 18, shows sixteen-ounces of water settled in the bottom of a Cessna 150 fuel tank. The second image, 152 Test Image 18, shows twelve-ounces of water settled in the bottom of a Cessna 152 fuel tank. 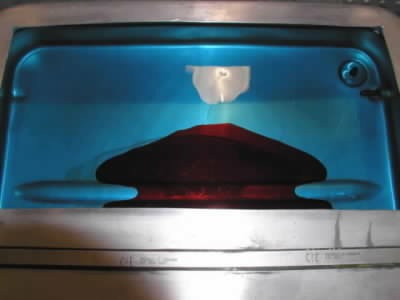 At this intermediate stage of each test, the red colored water appeared to settle at each tank’s sump. Neither sump was drainable. I believe that the quantities of water, sixteen ounces and twelve ounces, are quantities sufficient to constitute hazardous quantities. The experimental results indicate that the tested components are inadequate for use as a source from which to take a fuel sample for the purpose of detecting fuel contamination using prescribed preflight procedures. Additional information including details of the testing is available on the SumpThis web-site. Please visit http://www.sumpthis.com/ to view more images with brief commentary on results. The total accumulated red colored water shown settled in the tank is 16 ounces. This image shows a view of the tank's fuel pick-up filled with part of the settled water. The tank’s drain is located in the bottom left corner. The water settled in what appeared to be the tank's natural sump. The total accumulated red colored water shown settled in the tank is 12 ounces. This image shows a view of the tank's rear fuel pick-up and drain with respect to the 12 ounces of settled water. Results from these tests may indicate that both tank models fail to meet the standards set forth in CAR PART 3-1949-SUBPART E given above. SUBPART E Fuel Tanks section 3.444 (Fuel Tank Sump) requires "a drainable sump." 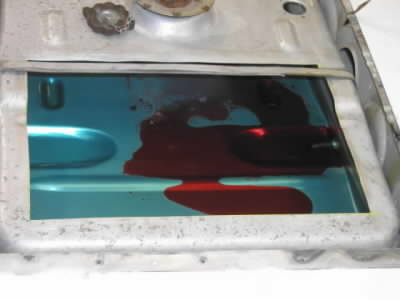 Results from the test performed on the Cessna 150 model tank indicate that the area in the tank that appears to be the tank’s sump is not drainable. The area that appears to be the tank’s sump is that area in the tank where fluids flow under the influence of gravity while the aircraft is in a normal ground attitude. The tank’s design includes a drain, but the drain is not located in or near the area that appears to be the tank’s sump. Thus, the Cessna 150-fuel tank’s sump does not appear to be drainable. Results from the test performed on the Cessna 152 model tank indicate similar results as the Cessna 150 tank. Thus, the Cessna 152-fuel tank’s sump does not appear to be drainable. SUBPART E Fuel Tanks, section 3.553 (Fuel System Drains) requires safe drainage of the "entire fuel system". The provisions for drainage shall be effective in the normal ground attitude." Test results for both tank models indicate that the "safe drainage" standard is met, but the requirement for draining "the entire fuel system in the normal ground attitude" is not met. That is, the drains that are part of each fuel tank’s design can be safely used, but the drains appear ineffective in normal ground attitude for draining some portions of the fuel system that should drain according to the requirements of 3.553. Furthermore, Subpart E-Power Plant Installations for reciprocating engines stipulates in section 3.411 (Components), "(a) the power-plant installation shall be considered to include all components of the airplane, which are necessary for its propulsion. It shall also be considered to include all components which affect the control of the major propulsive units or which affect their continued safety of operation". Thus, a fuel tank is a component of the power plant installation. A sump is a component of a fuel tank, which indirectly makes a sump a component of the power plant. Additionally, a drain is a component of a fuel tank, which indirectly makes a drain a component of the power plant. While in flight, a fuel tank can affect continued safety of operation if it fails to function properly. During a preflight check, a fuel tank can affect continued safety of operation if it fails to drain properly. Preflight procedures for aircraft that have the Cessna 150 fuel tank or the Cessna 152 fuel tank require fuel samples to be taken from these tank’s drains. The purpose of taking a fuel sample is to detect fuel contamination. Thus, the statuary law that gives authority to CAR Part 3, Subpart E intends for a sump not just to be drainable, but also to drain contaminants. This intent must be the spirit of the law because preflight procedures are written to make use of fuel tank drains for the purpose of detecting fuel contamination. This use makes a fuel tank’s sump and drain critical components that can affect "continued safety of operation." Furthermore, these components are subject to Subpart E, section 3.411(b): All components of the power-plant installation shall be constructed, arranged, and installed in a manner which will assure the continued safe operation of the airplane and power plant. The test results for the Cessna 150 fuel tank and the Cessna 152 fuel tank indicate that both tanks fail to meet the standards of section 3.411(b) because neither tank’s sump appears to be drainable. If a sump is not drainable, contaminants cannot be drained. If contaminants cannot be drained, they cannot be detected in a fuel sample. If contaminants cannot be detected, "continued safe operation of the airplane and power plant cannot be assured." The test results for the Cessna 150 fuel tank and the Cessna 152 fuel tank indicate the standards of CAR PART 3-1949-SUBPART E: are not met. As indicated, neither fuel tank provides a reliable means for positive detection of fuel contamination during a preflight check. But preflight procedures require that fuel samples be taken from the drains that are part of these components. Consider an engine that repeatedly experiences loss of power during flight. This component’s behavior should make the airplane in which it is installed unairworthy. Likewise, consider a component that is used to detect fuel contamination. If such a component repeatedly fails to permit positive detection of fuel contamination, then this component’s behavior should make the airplane in which it is installed unairworthy. Fuel contamination can lead to loss of engine power. For this reason, the law requires that a fuel sample be taken during a preflight check. The law also requires that a sump, if provided, be drainable. Pilots obey the law when they take a fuel sample from a drain provided for such purpose as to detect fuel contamination. Aircraft manufacturers obey the law when they design a sump that is not just drainable, but also drains contaminants when the sump is used for the purpose of detecting fuel contamination as prescribed in manufacturer-written, preflight procedures. The FAA certifies that manufacturers have obeyed the law, and pilots place faith in this certification each time they take a fuel sample. Unfortunately, within general aviation, some entities that distribute information to large audiences often stress the urgency to avoid fuel contamination by taking preventive measures such as using certain types of fuel caps or parking an aircraft in a hanger to avoid water contamination from rain. Preventive measures are prudent, but no measure of preventive effort will reveal if fuel contamination has been prevented. Upon reaching 200 feet above the ground after takeoff, if an aircraft’s engine quits due to fuel contamination, it does not matter where the contamination came from. What matters is that it was not detected during the preflight check. Regardless of where an aircraft’s fuel contamination comes from, it must ultimately arrive at a sump. To be detectable, fuel contamination must arrive at a drainable sump. When these conditions are assured, as they often are with FAA certification, fuel samples taken from such a drainable sump will reveal contamination. This circumstance only describes half the problem. This half of the problem does not even need FAA certification because pilots can see contamination when it’s revealed. They do not need assurances about the truth of results that they can see; however, they do need assurances about the truth of results they cannot see, the other half of the problem. When no fuel contamination is detected using certified preflight procedures upon certified components, the FAA certifies that the results are true. CAR PART 3-1949-SUBPART E section 3.411(b) states component "accessibility shall be provided to permit such inspection and maintenance as is necessary to assure continued airworthiness." The Cessna fuel tanks installed in models 150 and 152 aircraft that I tested are accessible components. My personal inspection of these tanks indicates that continued airworthiness is not assured. The conditions mentioned, if not corrected, can lead to a rough running engine or engine failure with danger of crashing depending on a pilot's ability to control an aircraft with a failed engine to an area for safe landing. The apparent lack of positive detection of fuel contamination affects immediate flight safety, and it is life threatening. Consequently, I recommend that the conditions stated in this letter be given a high priority evaluation for immediate action that re-evaluates type certificate No. 3A19 that "prescribes conditions and limitations under which the product for which the type certificate was issued meets the airworthiness requirements of the Federal Aviation Regulations." The results of the tests that I performed do not appear to duplicate the airworthiness standards implied by type certificate number 3A19. Mr. Williams, I urge your office to do whatever it can to initiate action. At a minimum, I recommend that pilots, aircraft owners, maintenance personnel and Cessna Aircraft Company be warned that fuel samples taken from a Cessna 150 fuel tank or a Cessna 152 fuel tank cannot be relied upon for detecting fuel contamination. These components appear to be inadequate for this purpose. I further recommend that the FAA re-evaluate the airworthiness aspects of the components inherent to type certificate No. 3A19 with regard to those components used in prescribed preflight procedures for the purpose of detecting fuel contamination. It may help you to consult FAA safety recommendations 99.283 and 99.284 that were submitted by Inspector Craig Roberts of the Nashville Flight Standards District Office around July 23, 1999 to Frank Del Gandio and Jeff Gorney, AAI-200. These safety recommendations address the same type of potential problem that exists in Cessna Aircraft Company’s integral wing tank design. Please contact me in writing as needed to request more information. I request a written acknowledgement of receipt of this letter as well as a written follow-up about action taken by the FAA on the subjects of this letter. Please inform in writing if FOIA requests are required for any information that I have just requested.